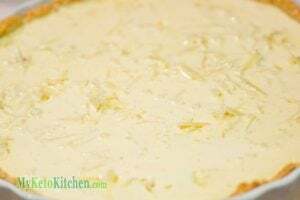 Keto Quiche Recipe - "Low Carb Lorraine" - With CRUST! 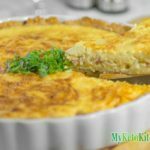 Gruyere Cheese is the true star in our Keto Quiche Lorraine recipe. It marries together the smokey bacon, creamy eggs and pungent mustard in perfect harmony. Preheat fan forced oven to 170C/340F. Mix together the almond meal, salt, pepper, melted butter and egg. Press the mixture into the base of your quiche dish and spread it evenly on the base and around the sides. Bake the base for 12 minutes. If the base begins to rise from air bubbles, gently prick it with a fork and press the base back down. Remove from the oven and set aside. 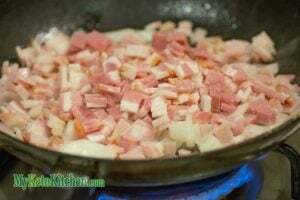 Saute the diced bacon and onion over medium heat until the onion is translucent. Spread the bacon and onion mixture evenly over the base and top with the grated gruyere cheese. 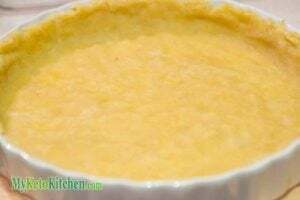 In a large bowl or jug place the eggs, cream, mustard, salt, and pepper, blend together using a stick blender. Ensuring that all ingredients are well combined. Gently pour the cream mixture over the bacon, onion and gruyere. Place the quiche back in the oven and bake for 25 to 35 minutes, the quiche is ready when the center no longer jiggles. Remove from the oven and cut into 10 pieces. Enjoy.